Hello, Friends! 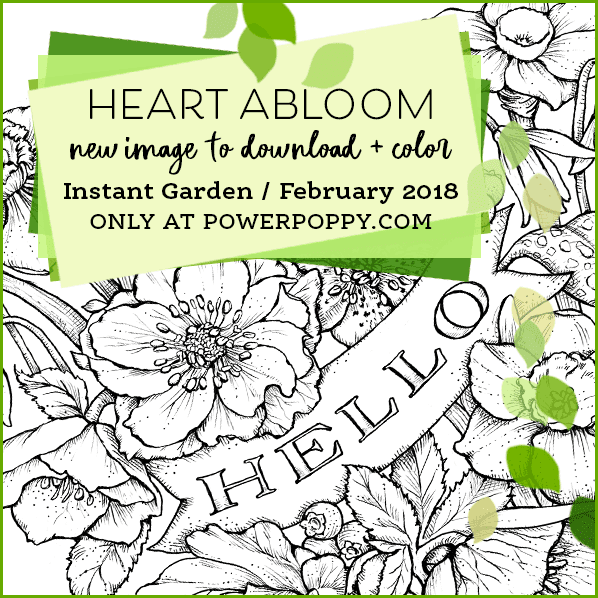 I've got a new Power Poppy digi stamp to share with you and I'm so excited about it. I said in my blog post the other day that I was working on a doozy of an image and today is the day I can reveal it. 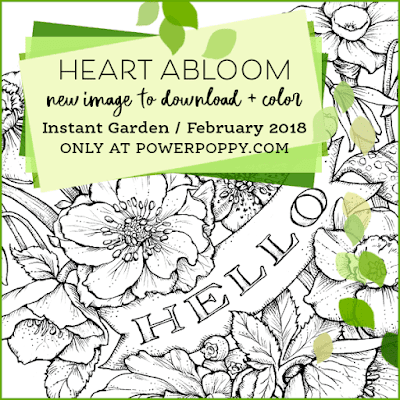 Feast your eyes on Heart Abloom! 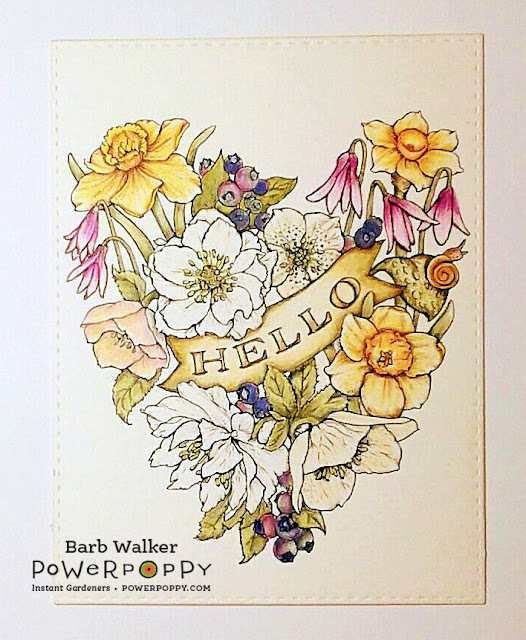 "A tapestry of spring flowers fill a large, lush heart shape in this Color Story adventure! The flowers for this heart were expressly chosen for this scene to celebrate yellows, greens, blues and purples. We have Daffodils and Narcissus, a myriad of single and double Hellebores, Trout Lilies, and then the surprise guest: Blueberries! Now, here’s the thing. Blueberries ripening on the vine start out a very pale greenish-white. The same stem can have a multitude of shades in white, pink, chartreuse, light and dark blue. Hellebores also are cross-pollinated to create loads of color combinations. So, whether you take this Color Story into cool territory with green, blue, deep purple, and white, or something warmer with blushes, yellows, and peachy tones, you are pretty much going to end up with a masterpiece!" I was going for an "old storybook" look. And, looking at my monitor, all of my foliage looks the same color. In real life, it is not. Each shape of leaf has a different green. Ack! Hopefully it will show up in my final project picture. Anywho...I printed the image onto the smooth side of a die cut piece of watercolor paper and I colored it with colored pencils. I used mostly Prismacolor pencils but I also used some Polychromos, as well as a few Tombow Irojeten pencils and a couple from Blick Studio. I had a ball coloring this and I look forward to finishing it and putting it on a card. That's it for me today. I thank you for stopping by. Please visit the Power Poppy blog to see what my team mates have created to share with you. You're going to want to buzz over because I'm hoping that Marcella will share her interpretation of this image...talk about mind blowing! She is Ah-May-Zing! There's a loooong weekend just around the corner! Yippie skippie! Your WIP is looking good, Barb. I know it will be totally gorgeous when completed. I would never even attempt to color this beautiful stamp. It's far too complicated for me. Oh my, Barb, this work in progress is wonderful so far. Look at all the different flowers and leaves and little bits of nature. Wow! You are doing an amazing job with it so far! I can't wait to see the completed piece. Since you are making this into a card, I've got to assume your piece is around 4 1/4 x 5 1/2? Look at all the detail that remains at that size?! Wow! Happy sigh!